Salt Tasting Room, Heather Hospitality Group’s award-winning eatery specializing in artisanal cheese, small-batch cured meats, and a dynamic array of wines, beers and sherries, welcomes a sleek new Kitsilano location opening July 9, 2013. Complementing the original SaltTasting Room in Gastown’s gritty Blood Alley, the West Broadway locale will stay true to the concept that has drawn a loyal following since it first opened in 2004. Guests are invited to assemble a tasting plate from the chalkboard’s carefully curated selection of 10 cheeses, 10 meats and 10 condiments. As the selections change constantly, it’s almost impossible to have the same Salt experience twice. Salt Tasting Room’s new digs are a welcome addition to the West Side neighbourhood, which has seen the need for an upmarket wine bar in recent years. Locals who relish the original Gastown room’s concept may now enjoy Salt’s expertly sourced cheeses, meats and bar offerings closer to home; differentiating itself from the many full-service restaurants in the area, Salt Tasting Room is perfect for an afternoon & early evening bite or a late-night snack. Seating 45 guests inside and 12 on the patio, the new 1,400-square-foot venue is home to a production kitchen that will service Salt in Gastown, along with other Heather Hospitality Group establishments Judas Goat and Bitter Tasting Room. The opening of Salt Tasting Room’s new Kitsilano location is a homecoming of sorts for owner Sean Heather, who spent his first four years in Vancouver managing local Benny’s Bagels. Heather is thrilled to return to the community that launched his prolific restaurant career in Canada 22 years ago. Salt Tasting Room’s West Broadway location is Heather’s 10th Vancouver establishment. Answering the call for more lunch destinations in Kitsilano, Salt Tasting Room will open for lunch later this summer. And, coming this fall, the eatery will open for brunch—a weekend ritual for local residents. 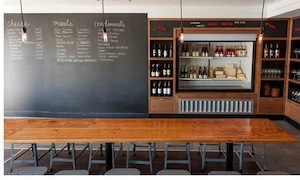 Salt Tasting Room specializes in artisanal cheese, small-batch cured meats, and a dynamic array of wines, beers and sherries. Guests assemble a Tasting Plate from the chalkboard’s selection of 10 cheeses, 10 meats and 10 condiments. Salt Tasting Room’s new Kitsilanolocation is situated at 2585 West Broadway, 604-428-0339 and is open Tuesday toSunday from 4:00 pm to midnight. Visit www.salttastingroom.com or follow on Twitter @SaltTastingRoom for more information.